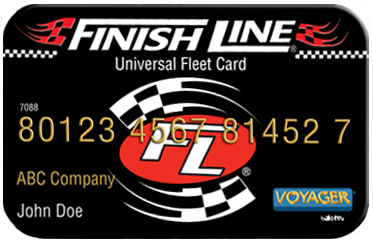 Finish Line Universal Fleet Card is an authorized Channel Partner of Voyager Fleet Systems. This allows Finish Line to bring you the top rated Fleet Card with coast to coast acceptance but with local customer service. As a Fleet Manager, you more than likely have more than one job in the company. Finish Line Universal Fleet Card gives you the tools you need to stay in control of your Fleet, while doing multiple tasks for your company. Finish Line Universal Fleet Card provides comprehensive driver, vehicle and exception reports to help you track your fleet’s activity within broad parameters, all set by you. So go ahead and work….we’ll help manage your fleet! With a single account, cards can be assigned to drivers and/or vehicles. Purchases can be controlled through an assigned PIN number. Limitations on types of purchases made with the card can be restricted at any level. Purchases can be limited by product (fuel and or all products), number of transactions per day, and/or dollars per month. FINISH LINE Univeral Fleet card Purchases are secure with Driver ID requirements. At the pump or inside electronic transactions will not authorize without a VALID Driver ID. Driver IDs can be easily added within hours and terminated immediately. Exceptions are identified on the Vehicle, Driver, and Exception Reports. The Vehicle and Driver Reports allow the customer to track the mile per gallon variances, pattern discrepancies, product variances, excess fuel purchases and various transactions made to the account. You have the ability to define your own exceptions. Invoice Reports are supplied monthly. Other reports can be viewed through the website. Transaction info. can also be supplied or electronicly for downloads into Fleet Maint. programs. Invoice Reports can be departmentalized at the customers request. Vehicle numbers or vehicle descriptions or both can be used to setup vehicle card information. Customers may select any or all of the available reporting options. Drivers or vehicles need only one card. Our card is accepted at major and regional brands in all 50 states. Our network has nearly 200,000 fueling locations and 20,000 maintenance locations nationwide. Customers can access online transaction data at anytime. Such as month to date or week to date transactions. View customer created exception reports. Our “one card” system gives you the ability to track and report on a specific vehicle’s monthly fuel and maintenance expenses. Your drivers no longer need to carry multiple cards and location books to manage their fueling needs. Cards can be easily added and in most cases arrive within a few days. You can restrict your cards to “fuel only”. Non-fuel purchases will not be allowed and declined if attempted. We have unusual activity reports to monitor your account for specific fuel grades. Our fleet card system will prompt your drivers for the odometer reading of the vehicle each time they fuel. When the drivers input the correct odometer readings, the system will track that information and calculate the distance, miles per gallon and cpm. You may chose to use the odometer prompt to track PO numbers, stock numbers or job site numbers, however, the system will require your drivers to input at least a one (1) digit number.